The electrical sub has finished their work and the local inspector did his walk-through. We got the sticker on our box saying we are ready for service, but the real shocker came later that day. Phil, the local L&I inspector, called our sub to give the three install techs a big “atta boy!” He continued on to say their quality of work and care of design was above par and he was very impressed with all the work they put into the house. We just experienced our first critical failure that could have resulted in the loss of the house. When I turned on a bathroom light and fan, the fan revved up and all of the lights in the bathroom, hallway, and room adjacent to the bathroom began to blink in different intervals. I turned the bathroom switches off and things returned to normal, except the breaker for the adjacent room had blown. Repeated switch flipping made the lights flicker but the fan was dead. A person could be forgiven for thinking the house was haunted, but I went downstairs and got my tools. An outlet tester revealed that flipping on any light in the affected area would flip ground and neutral. The eureka moment came when my voltage meter measured 150V at rest and 248V when the switch was flipped. I decided to call my brother in law, the electrician. One leg of the multi-wire branch circuit was draining to the other. There was no neutral. Since everything on both affected circuits was two-pole, there was no path to ground either. We traced the problem back to the panel and found that the original installers had not sufficiently tightened the neutral bus set screw for that circuit. Over the years, the wire somehow worked free enough to have intermittent contact. Based on this experience, I would definitely NOT recommend using multi-wire branch circuits in any home. It’s a neat concept, but not worth the risk and added inconvenience of losing fully independent breakers. If I had re-read this blog post recently, I might have recalled the additive voltage problem (described below) and headed straight to the panel, making this a 5 minute blip rather than an all-night ordeal. Electrical work is a special interest area of mine and I was very keen to see first hand how the pros do it. 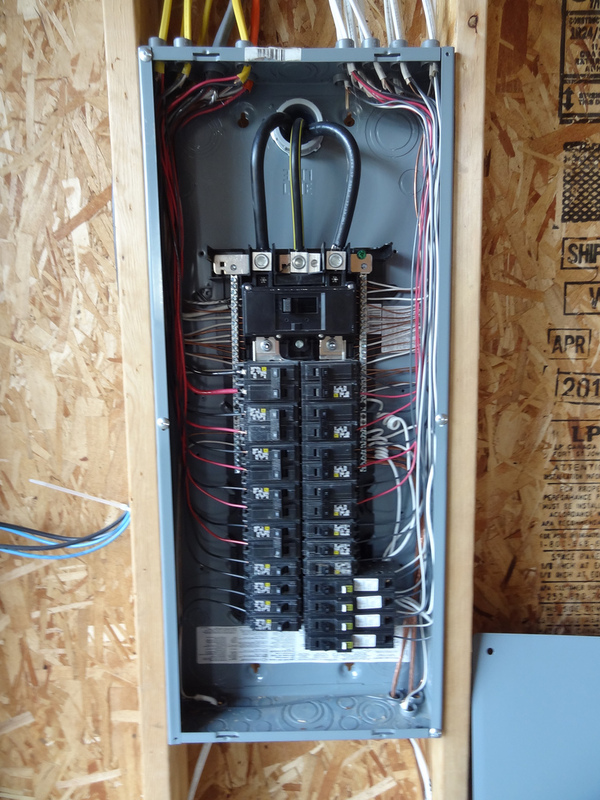 Frankly, I was surprised to see them use almost every breaker in this 200A panel, but their distribution system is very granular and makes a lot of sense. The installers used an interesting trick to save on time and copper as well: Instead of pulling two runs of 12/2 cable (black, white, bare) across the house for systems like the dishwasher and disposal, they pulled a single run of 12/3 cable (black, red, white, bare). This design is simple, elegant, and cost-effective. The red and black wires distribute opposite phases of electricity to a breakout box elsewhere in the house. At that point, the 12/3 is connected to two 12/2 lines and sent on to the final destination. 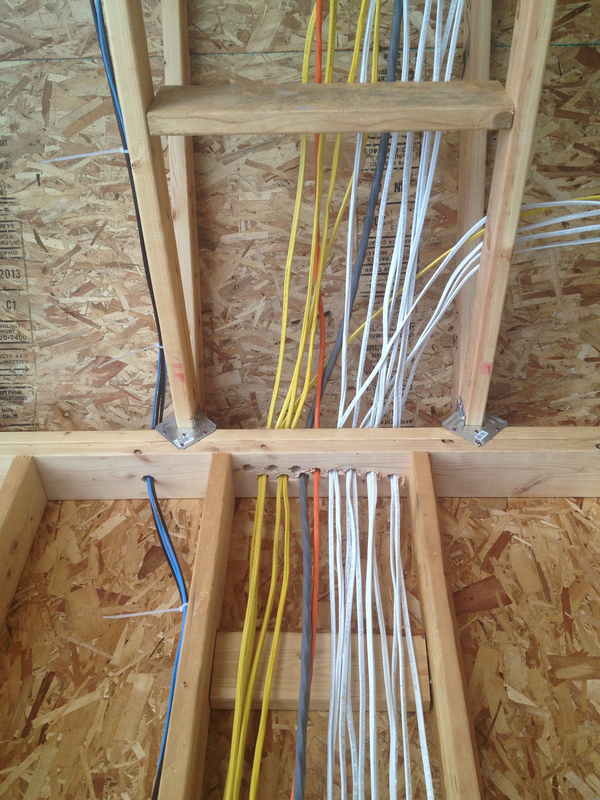 That means you have two 120V branches using the same common (white) and ground (bare) lines back to the box. The beauty in this design is that the red and black wires are opposite phase, so their return current cancels out on its way back to the box. Imagine your dishwasher is running and drawing 10 Amps on black and your disposal draws another 8 Amps on red. The white common wire would only carry 2 Amps back to the box. If the MWBC was wired correctly putting the two appliances on opposite phases, the return current is the difference between the hots. As with all things electrical, this technique must be used with caution. Improperly wiring both hots to the same phase creates an additive current on the common wire and disconnecting the common with a load connected can cause a dangerous over/under voltage situation. Consult a professional before mucking around with your wires! Once important thing about most MWBC is their ability to trip independently despite being tied together like a normal dual-phase breaker. Unless you have split phase at a single outlet or are using both phases in one appliance, the breakers need not trip simultaneously when overloaded. However, they must be connected with a tie which forces you to turn both breakers off simultaneously while servicing either circuit. This is important because if you just turned off the disposal breaker and someone started the dishwasher, the return current from that appliance would energize the shared common line at the disposal. Check out these links for more information on multi-wire branch circuits and independent trip MWBC. The garage floor just went in yesterday. I’m almost a bit sad to see it in because now I can’t park my car in the garage until the driveway is poured in several weeks. My Prius just doesn’t have the guts to make the eight inch leap from the dirt outside. This means that the garage doors will soon be appearing and I can get a head start on building my airplane in there*. Massive scaffolding appeared on-site late last week. On Monday, the siding subs arrived early to start work wrapping the house and nailing up the siding boards. A house in this stage has an unnerving look. 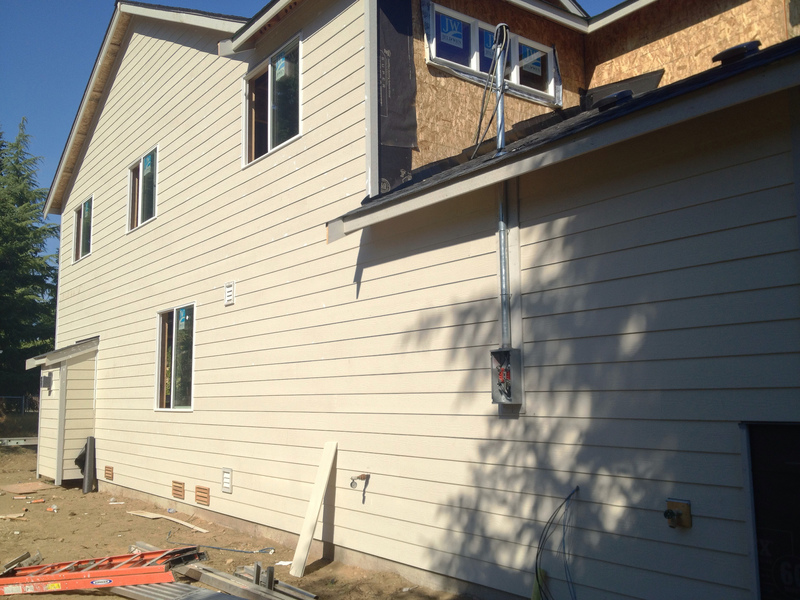 Once the siding is up, the house will be in the “uncanny valley” where it looks off but you just don’t know why at first–like a poorly done computer animation or a person with shaved eyebrows. It is the window and roof trim that goes unnoticed until it isn’t there. Its absence is conspicuous and jarring, making a freshly sided house seem strange. Once the siding pros have completed installing the broad boards, they’ll go back and trim the windows and add the cedar accent shingles. The painters will be by some point later on to finish the job. Without inquiring, I presume it will be about the same time they return to paint the inside of the house. * Just kidding… I’ll wait until the drywall is up. 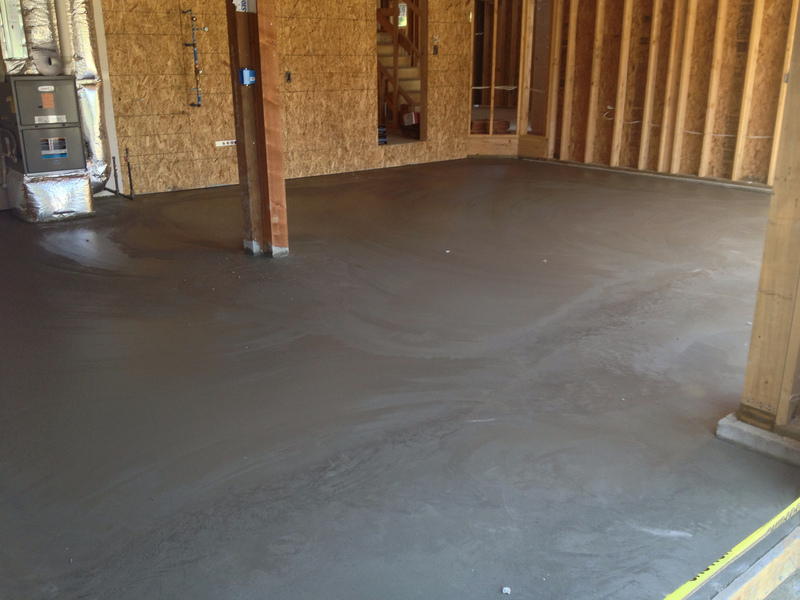 This entry was posted in Construction and tagged concrete, electrical, siding, trim, windows. Bookmark the permalink. The electrical sounds interesting. Any issues with GFI’s if they are on the same three wire run? When doing my garage floor, I had them leave on the 2×4’s that were used to form up the entrance edge. This protects the edge from being chipped during construction with all of the tools and material being brought in and out. The GFIs shouldn’t be a problem on MWBC if the branch happens upstream of the outlet. However, improperly branching downstream of the outlet will be problematic. That’s a great idea on the concrete lip. Turns out they did that for most of the lip already, but that’s something we might end up putting back on the other part.